You are about to learn one of the most powerful song writing techniques ever created. There is a special technique that I call Free Playing that will allow you to generate many new and interesting song ideas in a very short time. Once you learn the instructions, I highly recommend that you spend at least 10 minutes or more each day immersed in Free Playing. 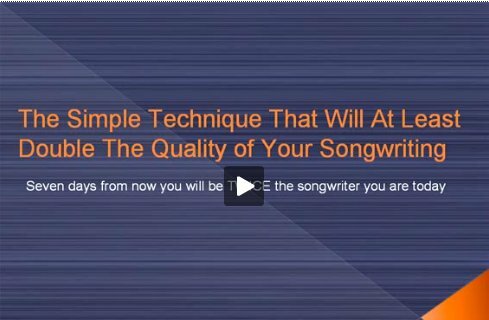 This technique will greatly accelerate your ability to write compelling music, causing you to advance more in a few months than most songwriters would in many years. So what exactly is this technique? Free Playing is a type of improvisation, with a few subtle twists. The most common form of improvisation is performed by jazz musicians. What happens is a musician will create musical ideas "on the spot" over a rough template or framework created by the other participating musicians. As this person weaves an individual path through the "framework" created by the other musicians, he is said to be "improvising". When a jazz musician improvises, they loosely follow set "routines" and "themes" using scales and progressions that fit the mood and style of the music. Free Playing is a little different. When you immerse yourself in Free Playing you actually try to avoid these routines and themes. Step 1. Choose the instrument that you will "Free Play" on. This can be any instrument, singing included. Step 2. Set up a recorder so you can record your "Free Playing" session. You must do this so you don't distract yourself by trying to "listen for the good bits". Step 4. As you play, continually direct yourself away from common themes and melodies. If you find yourself playing something you recognize, direct your playing away from it. If you find yourself getting caught up in a familiar "routine", guide yourself away from this and into new territory. Step 5. Keep sifting through ideas for a period of 5-10 minutes or more. The longer the session the better, and it's very likely that your best ideas will occur towards the end of the session. Step 6. After you’ve finished playing, stop the recording device and listen back to your performance. For maximum results, listen back once to the performance paying close attention to what's happening. And then a second time as background music while doing some other task. As you listen back, you'll be blown away at some of the unique, interesting ideas that you've generated. And the more you do this procedure, the easier ideas will flow in your sessions. Progress is made at light speed with a daily Free Playing session, and after the first 5 sessions you will find your recordings literally saturated with compelling song ideas of a quality that you have to hear to believe. There is a common question that comes up sometimes when I tell musicians about this Free Playing exercise. What If I’m Scared To Improvise? It's not uncommon for a musician to be a little scared to improvise. There is the fear that they will not create anything worthy of listening to, and because of this they will feel uncreative and an ineffective songwriter. If this is you, I absolutely urge you to begin Free Playing sessions despite this fear. Within a few sessions you will not only find that you are capable of creating music, but also that you are capable of creating stunning songs over and over again. Another thing to keep in mind is this: Whether you know it or not, you are improvising every day. Through my experience everyone has the ability to improvise in a song writing environment, and at a pretty good level too! All you need to do is get going and once you do, you will realize that "not being creative enough" was never an issue at all. It's about to get easier as well. You are about to discover the "key"that makes your Free Playing come to life and become one of the most exciting and enjoyable practices of your day. So What Is The Key To Genius "Free Playing"? Would you like to know how you can become one of those musicians that continually creates new and inspiring material? There is a key that will take this Free Playing concept to a new level. Can you remember when we talked about allowing self two to "take over" the song writing duties, as it's in self two that your master songwriter lies? Can you also remember our discussion about finding "the zone" or "flow state"? Both of these are actually the same thing. Finding your "flow state" where you perform at your best is actually the point where self two "takes over" and takes control of the performance. The key to creating mesmerizing music is to immerse yourself in Free Playing whilst also being in this "flow state". When you do this, you surrender control to self two who is the master songwriter that exists within you. Once you do this you will be "tapping into" your vast reservoir of creative resources that exist in your mind and body. And the results of this in your song writing will knock you over! The rest of this song writing success series is dedicated to giving you some easy exercises that will allow you to find this "flow state" so you can allow self two to "take over" and create some truly amazing music.